We recently ran a hackathon at work: people within IBM were invited to try building a mobile app aimed at consumers using Watson services. It was a fun chance to try out some new ideas, as well as to build something using our APIs – dogfooding is always a good thing. I worked on a hack with David which we submitted on Wednesday. This is what we came up with, and how we built it. 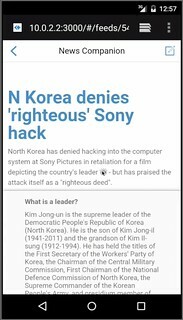 A mobile app that will help users to digest the news by explaining references in stories and providing greater context. It’s difficult to find the time nowadays to properly read and understand what’s going on in the world. We rarely have the time to sit and read through a newspaper. Instead, we might quickly read news stories online from our smartphones and tablets. But that often makes it difficult to understand the broader context that a story is in. There might be references in the story to people, places, organisations or events that are unfamiliar. Watson could help. It could be an assistant as you read the news, explaining unfamiliar references and the broader context.